Thanks to the Brain Scoop, the youtube channel for the Field Museum and their top-notch, high-speed delivery. In this case, host Emily Graslie shares an insightful rundown on some artifacts in the museum surrounding this 1893 event. I guess in the comments section of this video a troll tried to explain that the necklace admired by Emily G is in fact not to be admired and is in fact “primitive”. (Not to mention discouraging political analysis in museum videos). Bang! 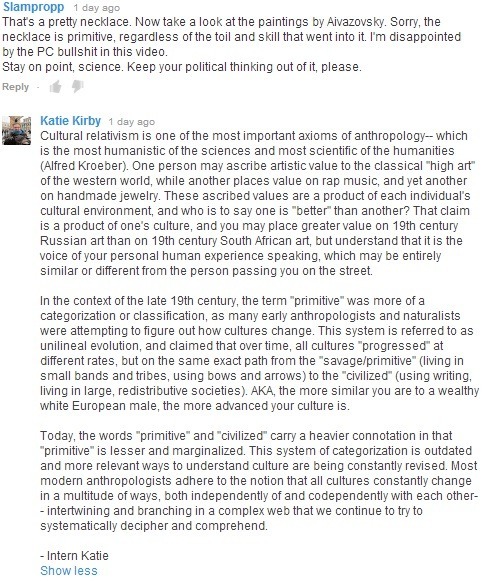 Here comes “intern Katie” who explains a few thoughtful ideas to this commenter.